Most bumps on the eyelid are styes. A stye is an inflamed oil gland on the edge of your eyelid, where the lash meets the lid. It appears as a red, swollen bump that looks like a pimple. It is often tender to the touch. A stye is caused by a blockage of one of the oil glands in the eyelids. This allows bacteria to grow inside the blocked gland. Styes are a lot like common acne pimples that occur elsewhere on the skin. You may have more than one stye at the same time. Styes most often develop over a few days. They may drain and heal on their own. A stye can become a chalazion, which occurs when an inflamed oil gland becomes fully blocked. If a chalazion gets large enough, it can cause trouble with your vision. If you have blepharitis, you are more likely to get styes. Xanthelasma: Raised yellow patches on your eyelids that can happen with age. These are harmless, although they are sometimes a sign of high cholesterol. Papillomas: Pink or skin-colored bumps. They are harmless, but can slowly grow, affect your vision, or bother you for cosmetic reasons. If so, they can be surgically removed. Cysts: Small fluid-filled sacs that can affect your vision. 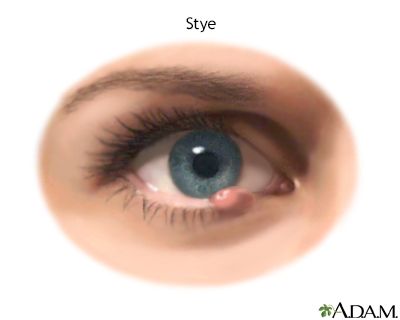 In most cases, your health care provider can diagnose a stye just by looking at it. Tests are rarely needed. Apply a warm, wet cloth to the area for 10 minutes. Do this 4 times a day. 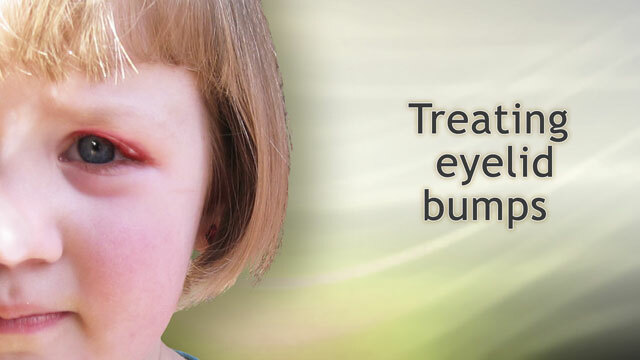 Do NOT attempt to squeeze a stye or any other type of eyelid bump. Let it drain on its own. Do NOT use contact lenses or wear eye makeup until the area has healed. Styes often get better on their own. However, they may return. The outcome is almost always excellent with simple treatment. Sometimes, the infection may spread to the rest of the eyelid. This is called eyelid cellulitis and may require oral antibiotics. This can look like orbital cellulitis, which can be serious problem, especially in children. You have problems with your vision. The eyelid bump worsens or does not improve within a week or two of self-care. The eyelid bump or bumps become very large or painful. You have a blister on your eyelid. You have crusting or scaling of your eyelids. Your whole eyelid is red, or the eye itself is red. You are very sensitive to light or have excessive tears. Another stye comes back soon after successful treatment of a stye. Always wash your hands very well before touching the skin around your eye. If you are prone to getting styes or have blepharitis, it may help to carefully clean off excess oils from the edges of your lids. To do this, use a solution of warm water and no-tears baby shampoo. Fish oil taken by mouth may help prevent plugging of the oil glands. Sciarretta V, Dematte M, Farneti P, et al. Management of orbital cellulitis and subperiosteal orbital abscess in pediatric patients: A ten-year review. Int J Pediatr Otorhinolaryngol. 2017;96:72-76. www.sciencedirect.com/science/article/pii/S0165587617300915. Wu F, Lin JH, Korn BS, Kikkawa DO. Benign and premalignant tumors of the eyelid. In: Fay A, Dolman PJ, eds. Diseases and Disorders of the Orbit and Ocular Adnexa. Philadelphia, PA: Elsevier; 2017:chap 22.